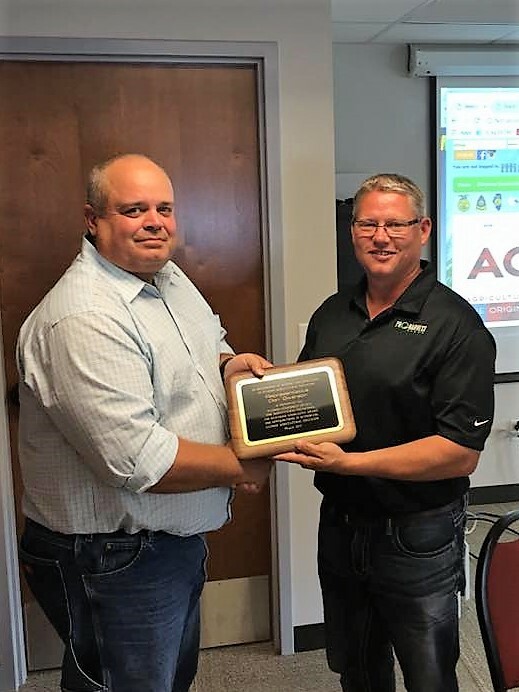 State Representative Dan Swanson was feted on Thursday, August 31st by the Illinois Leadership Council for Agricultural Education (ILCAE) with the 2017 Jim Guilinger Legislative Award. “I am very honored to receive this award for advocacy for agricultural education. Agricultural education is a program that is working. More students involved with agricultural education are working than ever before, as this industry is the largest industry employing Illinoisans,” said Rep. Swanson. Agricultural Education has only been a field of study in Illinois public schools beginning about 40 years ago, due in large part to the advocacy of ILCAE. ILCAE’s advocacy has helped to better orient secondary education with jobs in the economy. Agricultural education has a proven track record of graduating students who largely enter post-secondary education environments and continue to advance the field in truly inspiring ways. Despite that record of success, agricultural education is often on the chopping block. Many programs have been saved by incentive funding. Jim Guilinger, the award’s namesake, was a teacher in Sycamore, Illinois who was named top vocational-ag teacher in the U.S. in 1982. Rep. Swanson was awarded the honor at the ILCAE’s meeting in Decatur, nearby the 2017 Farm Progress Show, on Thursday, August 31st. Rep. Swanson’s predecessor in the 74th District, Rep. Don Moffitt, was a 2005 recipient of the Jim Guilinger Legislative Award as well.